How do your fluids flow? Since working for a short while with the Samos Volunteers Group in September 2016, the situation regarding refugees has changed drastically. This video expresses the concerns of two volunteers from four months ago. ∼ Do your own research and you will see that the the situation has become worse since this video was posted. Now about to embark on a three-week stretch of the second fieldwork on Samos we do not really know what to expect, or how we can contribute. The organisers do not have time to convey much information. They are under much pressure now. So the plan is to join the activities we previously participated in (if they even exist) and take it from there. To explain, we worked in a refugee shelter for vulnerable groups, such as families with small children and babies and unaccompanied minors who may be abused inside the camp. What we did last time was to contribute to the swimming lesson for children and the women’s english language class. As one of the speakers on the video said, teaching english is more like a social event than a lesson. To practice speaking another (european) language gives hope that there is a way out of dire compounded conditions. 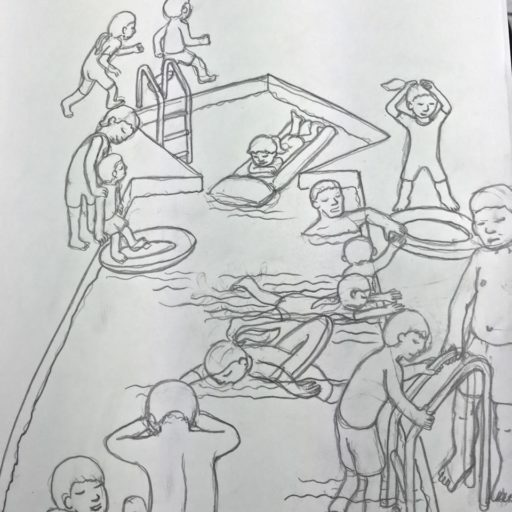 The first publication of Amphibious Trilogies is a colouring book in 300 examples that may entertain the children while the women concentrate on their language lesson. The line drawings are simple figures; such as an origami boat and plane, a kite, a superhero refugee kid with a special super-powered cape, a super heroine princess with a wand and a frog. These images come from impressions from the children in the shelter. Each page, a ‘lucana’ – is an empty space that can be filled up. Each drawing proposes another activity that we can potentially do with the children. Only 4 days away from traveling to Samos I cannot concentrate on much else. Click & Drag: Rotate the view. Right Click & Drag: Pan the view.